As many of us would have predicted (had we bothered with such a prediction), with the release of the IPCC AR5 WGII report, deniers have been busy protesting climate science. Larry Hamlin says the risks are overstated (archived here). Anthony Watts says a journalist for the LA Times is wrong and that crop yields are not depressed because Roy Spencer told him so (archived here). One of the panel's most striking new conclusions is that rising temperatures are already depressing crop yields, including those of corn and wheat. In the coming decades, farmers may not be able to grow enough food to meet the demands of the world's growing population, it warns. So next I turned to the WGII report to see what it stated about crop yields. Chapter 7 is the one about food security and food production system - for people (like me) who find this latest report even harder to navigate than WGI. Studies have documented a large negative sensitivity of crop yields to extreme daytime temperatures around 30°C. [Chapter 5 AR4, 7.3.2.1.1] These sensitivities have been identified for several crops and regions and exist throughout the growing season (high confidence). Many studies of cropping systems have estimated impacts of observed climate changes on crop yields over the past half century, although they typically do not attempt to compare observed yields to a counterfactual baseline, and thus are not formal detection and attribution studies. These studies employ both mechanistic and statistical approaches (7.3.1), and estimate impacts by running the models with observed historical climate and then computing trends in modelled outcomes. Based on these studies, there is medium confidence that climate trends have negatively affected wheat and maize production for many regions (Figure 7-2) (medium evidence, high agreement). Since many of these regional studies are for major producers, and a global study (Lobell et al. 2011) estimated negative impacts on these crops, there is also medium confidence for negative impacts on global aggregate production of wheat and maize. Effects on rice and soybean yields have been small in major production regions and globally (Figure 7-2) (medium evidence, high agreement). There is also high confidence that warming has benefitted crop production in some high-latitude regions, such as Northeast China or the United Kingdom Jaggard et al., 2007, Supit et al., 2010; Chen et al., 2010; Gregory and Marshall, 2012). Yield is affected by growing conditions as well as by planting improved varieties. Plant breeders continue to develop new varieties with improved yield in some crops. But plant breeding can only go so far. Determining what yield would have been like without global warming is not straightforward. Not only that, but yield is only part of the equation. To feed the world requires a growth in total production (total quantity harvested), not just yield (quantity harvested per hectare). If areas of land become unsuitable for growing particular crops because yield drops too much, then either new areas will have to take up the slack or there'll be less of that crop to go around. Anthony Watts and Roy Spencer pointed me to the USDA website that has quite a bit of information about crops, total production and yield. I drew up some charts - which I must admit don't inspire confidence in our ongoing ability to feed a growing world population. I've picked out a few of the most common field crops - corn (maize), wheat, barley, oats, sorghum and rice. First let's look at yield. That's what Anthony wrote about and that's what was mentioned in the LA Times article. I suggest clicking on the chart to enlarge it. What the chart suggests is that corn yield continues to improve linearly. Wheat has had its heyday. Yield continues to improve but not like it did up to around the mid 1990s. Sorghum isn't making any great strides at all. Rice has picked up a bit after a lull in the late 1990s. The question that the IPCC would like addressed is whether or not the yield is being adversely affected by global warming. You can't tell that from the charts. 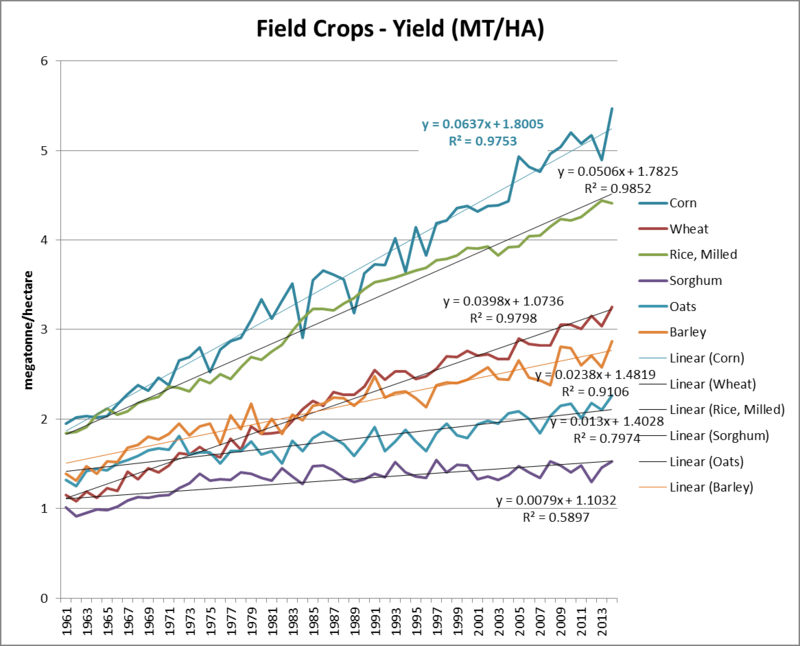 You'd need to separate out the yield improvements as a result of plant breeding and crop management from any effect of climate. In other words, if global warming wasn't happening, would the yield be greater or less than it is. Once again, corn is the clear leader, with a huge hike in total production in the past few years. Wheat is tapering off. Rice has moved back toward the trend line. Oats and barley are in decline and sorghum is fairly steady. Lastly, consider the area harvested for the same crops. Looking at the chart, the area planted to corn has gone up in the last few years in particular. Putting this chart together with the other two, corn has a double advantage - more area planted plus considerable improvement in yield. 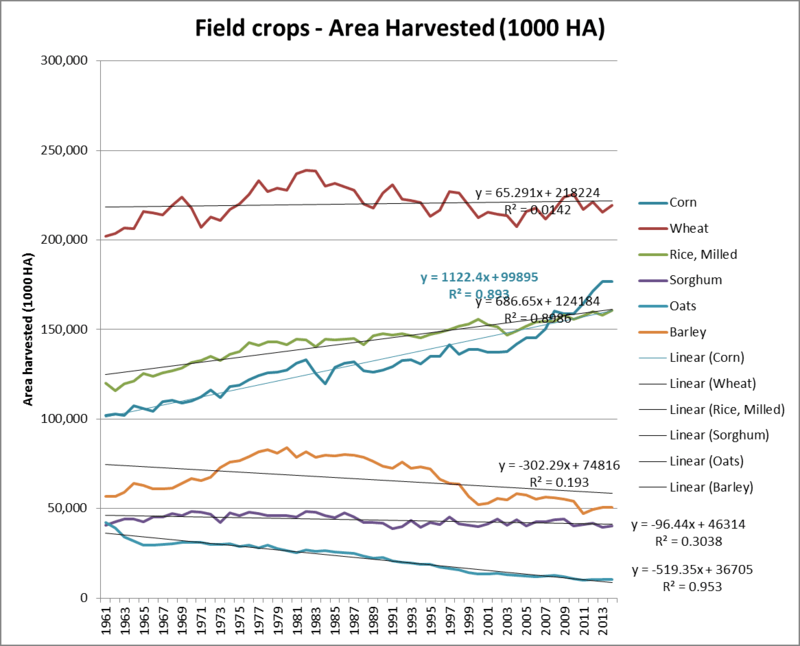 Wheat on the other hand has to rely on yield improvements because the area planted has shrunk compared to the late 1970s. Rice growing continues to expand. Oats and barley are quite out of favour, while sorghum is only slowly declining. What does this mean? Keeping pace with a growing population. These field crops are only interchangeable to a limited extent from a cropping perspective. Corn and rice needs lots of water. Wheat, oats and barley can be grown as dryland crops but they need moisture to germinate. They don't want too much rain when the grain is ripening or they'll get all sorts of fungal infestations and other problems. Sorghum can grow where other crops can't, but there are a lot of different types suiting different conditions. In other words, when climate changes - autumn or spring rains are no longer reliable, or the summer is wet instead of dry, or there are extended periods of drought and the irrigation water is no longer available - then production drops in that region, or even ceases entirely. The reason I'm not encouraged is that looking at wheat for example, it suggests that any growth in total production will come down to continued improvements in plant yield, not in area planted. There is only so much improvement before yield improvements start to taper off. But the human population is still increasing. On the other hand, in the marginal cropping land in some regions, farmers are giving up. Wheat has been grown on marginal land in south western australia - and that's getting drier. I'm not going any further with this for now. There is more on the topic in WGII (Chapter 7). Just thought it worth an article because we need to eat. And if production doesn't keep pace with the growing world population then food prices will rise and food will become scarce. This will have lots of flow on effects such as famine, civil unrest and mass migration. Plus large areas of land may be left unmanaged, with consequent damage to the environment. There were lots of people who moaned that newspapers and journalists don't check facts. Ironic, eh? The journalist wrote what was in the IPCC report. It was the WUWT crowd who didn't check the facts - they just lapped up what Anthony Watts and Roy Spencer fed them, without question. Without checking it for meaning or accuracy. You’re letting facts get in the way of feelings…. The facts are boring and don’t sell newspapers, but scary unfounded stories sell newspapers. It is probably no more than this. Also, the hack was too lazy to check the facts, or so uninformed and pig ignorant that he did not know where to look. The difference between a good reporter and a poor one is this: a good reporter checks the facts; a poor one doesn’t. It seems as though the AGW movement, if we can call it that, survives and thrives because the quality of good media reporting has dropped considerably. Will the refutation of their just plain wrong claims be allowed in their letters to the editor? Maybe we could convince Lord Mockton to write a post that again uses the graph showing both CO2 vs Time and Temperature Anomaly vs Time with the thirteen plus year pause while CO2 continues to climb. Further in the post would be a second graph showing Agriculture Yields vs Time and CO2 vs Time, illustrating the correlation between CO2 concentration growth and Agriculture Yields. In other words CO2 equals Plant Food. QED via the Correlation yields Causation logic of the Alarmists. The third possibility is a willingness to ‘shade the truth’ sufficiently to create a perception of alarm…. and sell more subscriptions to secure his paycheck. Tony did his job. He spread fear so the Progressive boot can be pressed against our necks. If it keeps getting colder, we will see crop reductions. So Tony may have his predictions right even if he’s a bit off regarding causation. Malthus predicted, in 1798, that population growth would outstrip food production. He made that prediction at a time when the world had less than 1 billion people. Food production has somehow managed to keep pace with population in the subsequent 200 years. I suspect that this alarmist claim of future food shortages, derived from a medium confidence in some computer model, will also be proved wrong. There isn't a somehow about it. Artificial selection for crops and animals, artificial fertilisers, irrigation schemes. The appliance of science. Eventually, however, Malthus's prediction must come true as there is only a finite surface area on which we can grow crops and a finite volume in the waters from which we can harvest fish and other produce. This isn't alarmist - simple maths will demonstrate that it is inevitable. Unless, of course, some other factor that we have so far missed becomes important. That's why Malthus has been wrong so far. He couldn't foresee the advances science would make. And the proverbial little boy cried wolf, yet there was no wolf. Therefore by your logic wolves do not exist. What a comfort this must be to people with an irrational fear of wolves. Malthus was explaining what had happened in his recorded past. The implication was that it would happen again, and that's yet to be proven wrong. Between Malthus and now the Americas and Australasia have become huge providers to a market globalised by steam-powered transport and refrigeration. No new continents are coming on line now, technological improvements are incremental and population is still rising. Where Malthus was wrong was in the assumption that population would always increase to the limit, but in Europe and Japan we've seen that populations can shrink when family-planning is the norm. That's what people choose when they can. The current increase is happening while family size is falling but more families are being formed by the previous generation. If humanity gets over the 9 billion hump it might actually avoid another Malthusian crisis and his "prediction" will prove to be wrong. Frankly, I don't see it happening. I would be interested to know how much of that corn yield and planting is for biofuels, oil and syrup. 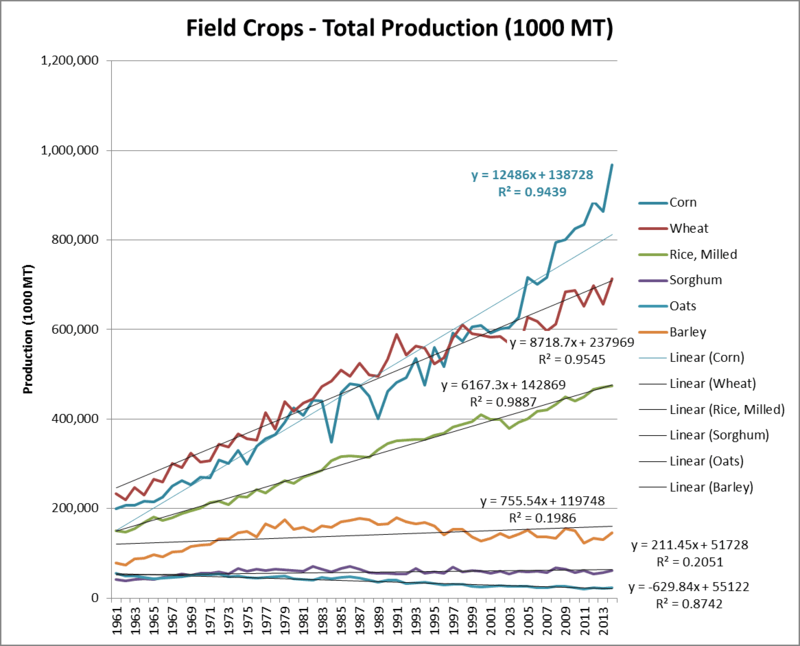 Do the charts show only crops planted for human consumption, or do they cover all uses? Do they include crops for animal feed? I just used total world numbers, so the use will vary. Some will be for seed, some for (stock) feed, some for food and some for other purposes like fuel. In the context of this article, that's all that's needed. If you can grow corn for biofuel or feed for stock, you can probably also grow food for humans. Although the grain quality for those products may not command food prices at present, if food gets scarce that could change. Like you suggest, I imagine most of the new corn is for biofuel. I should add that there a quite a few factors I didn't bring up. For example, agricultural production will shift according to the market. When there's a glut of wheat and it starts getting piled up in bunkers all over the USA (which happens), then Australian wheat growers might plant something else for a couple of years till the prices go up again - and vice versa. I seem to remember seeing a documentary back in school where they covered the effect of increased CO2 availability on crop growth, and they determined that while it increases the bulk of biomass harvested, the nutritional value remains unchanged - you just have to harvest, ship, and eat more mass to get the same benefits. Of course, this from a hazily remembered educational video seen more than two decades ago, so take that with a grain of salt. Here's what's been found for different varieties of wheat grown in western regions in Victoria (my home state). I'd say that plant breeders will be selecting for traits that improve or at least don't deteriorate or deteriorate least as CO2 increases. Yeah, that's much more specific than the experiment I remember, which was about greenery, rather than grains, and included a range of plants. The two conclusions that I remember is that weeds with little or no value to humans benefited far more from increased CO2 than more useful plants (in terms of both the rate and magnitude of growth,) and that pest damage was greatly increased due to the relatively low nutritional content of the plants. In any case, the "CO2 is plant food!" response is exceedingly silly. There's quite a bit of work going on in regard to selecting and breeding plants (crops and pasture species) for different localities as climates change. Some things I've read about include selecting deep-rooted pasture species for improved drought resistance. That article I found shows that there is a lot more to consider than plant growth response. With wheat, for example, the different varieties are grown for different purposes - bread-making and baking vs pasta for example. And it's more than just protein content too, from the look of it. You make a good point in regard to the changes that will happen in regard to crops vs weeds. There's also the fact that some plants (C3 ie most plants) respond to a change in CO2 and others don't so much (C4 eg maize and sugar).